Arcade Jumper is a fast-paced retro-style side-scrolling platform arcade game that invokes many of the classics, including Donkey Kong, Mega Man, Space Invaders and even Super Mario Bros. It’s abundantly clear from the get-go that the developers, Black Hive Media, have a deep affection and understanding for this genre, and they’ve made it available for the very agreeable sticker price of $1.99 as a universal iPad , iPod touch and iPhone app. The game takes place in the 1980s, the glory days of the arcade, and little Jimmy has stumbled into the magical Megacade machine at Ghosty’s arcade. With little brother Jimmy trapped, it’s up to big brother Eddy — the player — to enter the machine and save him. To do that, the player will have to traverse 10 zones with 3 stages each, and by doing so, he’ll eventually reaching a showdown with the extremely challenging big bad: Mr. Destructoid. What distinguishes Arcade Jumper from other iOS platformers is atmosphere. This application has full iCade and Joypad support. Alternatively, the player can opt for on-screen arcade controls, and those controls emulate old-school arcade surprisingly well. 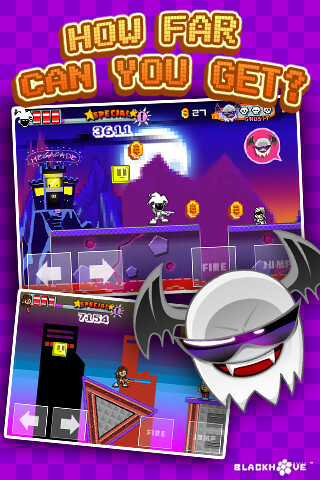 The Arcade Jumper application also has an amazing array of 80s-style digital arcade music. The “playlist” is so diverse that even frequent players won’t grow bored or go batty listening to it. 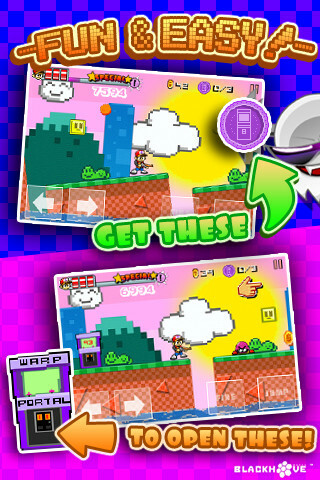 Another aspect that sets Arcade Jumper apart from other apps in this genre is randomization. The app has 10 zones with 3 stages each, but it also randomly generates each zone-stage level as you enter it. Traditionally, platformers have been all about finding patterns and then exploiting them. That’s true here as well, but by randomizing the levels, the program makes it much more difficult (and fun) for the player to lock onto those patterns. Arcade Jumper is not without its flaws. There are some collision detection issues in the first version, and they make play quite frustrating at times. There are also some design issues. For instance, the player earns a “continue” with each 25,000 points accrued. The problem with that is that the first 25k points are very hard to come by, and the player will be about one-third of the way through the total progress before he earns that coveted first continue. Quirks aside, Arcade Jumper is one of the best platformers available for iOS. As mentioned, it’s available as a universal app, so you buy it once, and install it to all your iOS devices. As with most games, we prefer Arcade Jumper on the iPad . When gaming, everything is better when bigger. Nevertheless, Arcade Jumper works quite well as an iPod touch and iPhone app , and it’s a perfect choice for those looking to pass time on the commute home. AppSafari review of Arcade Jumper was written by Darius Reimm on October 5th, 2011 and categorized under Action, Adventure, App Store, Games. Page viewed 3545 times, 2 so far today. Need help on using these apps? Please read the Help Page.